I am a huge fan of Teochew food, a southern China regional cuisine. In Southeast Asia, there are a lot of Chinese of the Teochew descent and many of us are familiar with the homey and delicious Teochew dishes. Today, I am very happy to have Ju at The Little Teochew as a guest writer. Based in Singapore, Ju is a talented home cook and a mother of three. The Little Teochew is a resourceful food blog with many Teochew, Chinese, baking, and everyday recipes. Please welcome The Little Teochew to Rasa Malaysia as she shares her scrumptious fried radish cake (菜头粿) recipe. Rasa Malaysia is literally an icon in the flogosphere, while I am just The Little Teochew. So, it is a huge honour for me to be guest blogging today. 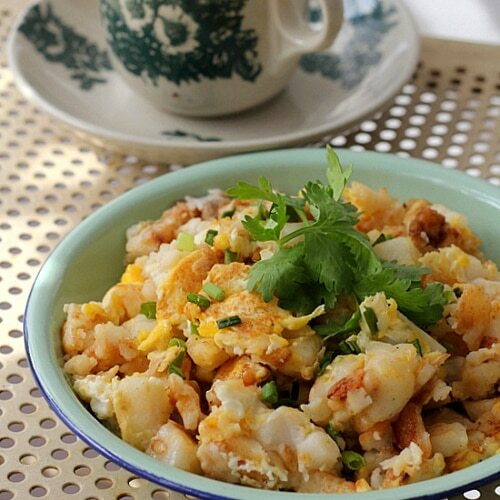 When Rasa Malaysia suggested a Teochew dish, I knew what I wanted to make – Chai Tow Kway (Fried Radish Cake or 菜头粿). I really enjoyed doing up this post because it brought back many happy childhood memories (hence the “old school” feel of my photos). I grew up eating the Chai Tow Kway at Siglap wet market…those were days when people would BYOE (Bring Your Own Eggs!) for the hawker to fry their Chai Tow Kway with, and ate this dish with toothpicks instead of chopsticks or forks. If you are a child of the 1970s living in eastern Singapore, you will remember this. Ah, nostalgia! Anyhow, this recipe uses a very high ratio of radish to flour. As my late father would say, “the real deal”, where you get to taste the chai tow (radish) and not the flour. Feel free, though, to adjust the proportions of radish, flour and water. Unlike baking, there are no hard and fast rules to making this, and a little more (or less) here and there will not hurt. Do remember that increasing the amount of radish and water will yield a more tender texture, while increasing flour will give you more ‘bite’. I hope you’ll enjoy making and eating this dish as much as I did! Over a very low flame, steam grated radish + 50ml water in a thick stainless steel pot (or non-stick pot). About 30 mins, or until radish turns translucent. Remove cover and allow to cool. Combine rice flour, salt and water. Mix well to combine. 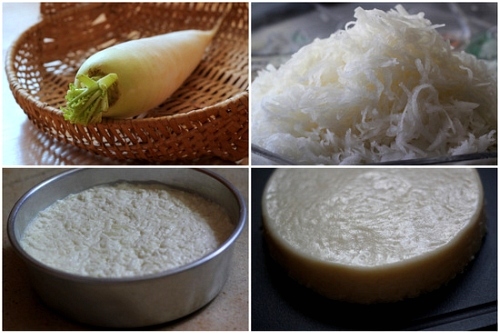 Add rice flour solution to cooled grated radish. Stir and mix before pouring into a metal cake tin for steaming. The final mixture should resemble a somewhat watery coleslaw. Steam on high for 40 mins. Leave it until completely cool (best overnight in the refrigerator), so that the radish cake firms up. It will be easier to handle too, as it will not stick to the knife when you're cutting. 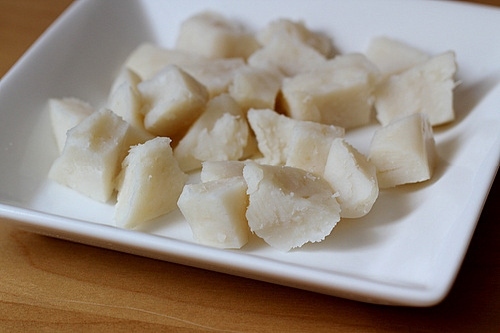 Cut up steamed radish cake into small chunks. Smaller chunks will crisp better, and the result is a more delicious plate of Chai Tow Kway. You want a contrast in texture - a crisp exterior and a soft interior. And those really small, charred, crispy crumbs? Heaven. In a non-stick skillet, heat oil and fry radish cake chunks till lightly browned and slightly crisp. Heat should be medium high. Add minced garlic and chai poh. Fry till aromatic. Drizzle a little more oil if it is too dry. Add fish sauce, pepper (and lashings of chilli sauce, if you like it spicy). Fry to coat evenly with seasoning. Pour beaten eggs all over radish cake. Allow the eggs to set slightly before flipping over in sections. It's OK if it starts breaking up when you flip over; you don't need to have a perfect whole. At this stage, you can dish up and serve with spring onions if you are making the white version. 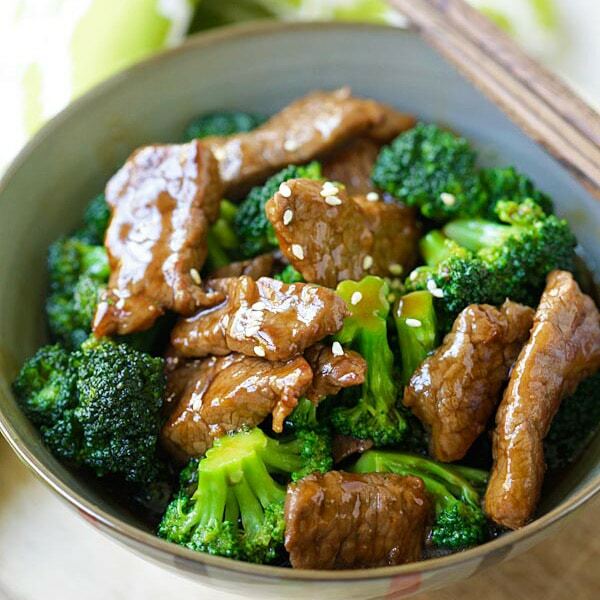 Drizzle Rose Brand Thick Sweet Sauce and stir fry to mix well. Dish up and sprinkle liberally with spring onions. Garnish with coriander leaves. Teochew cuisine is one of the few which makes use of fish sauce due to Chaoshan's coastal land. I’ve been wanting to make this for a long time. I bought the flour and the radish, but then I got too lazy. However, you make it look so simple that I’m going to make myself make this! Ju!! So happy to be making a comment on one of your excellent dishes!! Believe it or not, I have actually tried my hand at making this dish, though my results certainly pale in comparison to yours and I have never been so lucky as to eat this on the street in Singapore or Malaysia. Sigh – someday. What cool childhood memories! I love how you’ve brought that to life here. Excellent guest post, my dear! I made something similar to this with shrimp. I would really like to try this recipe. Bookmarked! i absolutely love the black version too, although they call this carrot cake in singapore! I love the black version too, especially if they are cooked almost burnt with the burnt aroma, the chai poh is a great addition. It is such a delight to see Ju make this dish. The Chai Towkuay looks absolutely scrumptious. Tigerfish, we should meet. We could have been classmates!!! Yeah, 黑的 rules!! Hi Little Teochew and Tigerfish -by reading both your messages make me missed Joo Chiat. Yes, I remembered we used to have black carrot cake for supper and it cost only 30 cts per packet. In NZ, we do not have such dish only the normal radish cake being served at Dim sum. The dish look yummy. Kia ora! That’s why I really, really enjoyed doing this post. :) So many happy childhood memories. I was telling my children about the old lady at Siglap wet market, who used to cut the huge chunk of radish cake (with a string) for her daughter (or was it her daughter-in-law?) to fry in the giant skillet. The image is etched so vividly in my mind! Hi Ju, it is great to see your guest post. 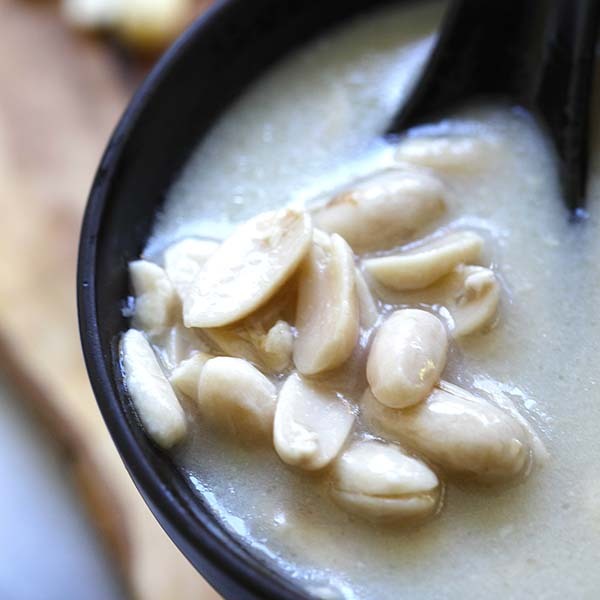 I had never heard of Teochew cuisine until I stumbled upon your blog. I like the look of the black version too. This seems to be similar to our Penang Char Koay Kak, except tht we add bean sprouts right? I grew up preferring the black version but with age, I’ve starting migrating towards the white one! This is a fascinating recipe; I would love to taste it! time to make some more! it has been awhile. this is super yummy. Hi! I love this – I get my ‘fix’ from the ‘pasar malam’ – night markets here. Hi, I would love to try this recipe, can you please post a picture of the Rose Brand Thick Sweet Sauce? Thank you. Thanks for posting the photo, Bee! For the benefit of readers who want to know more Rose Brand Thick Sweet Sauce, may I elaborate a little here. :) This sauce is made from molasses, sugar, water and caramel. It is also used for frying Char Kway Teow (flat rice noodles). Another alternative would be Prima Taste brand thick sweet soy sauce packet (which I remember Ellie of Almost Bourdain had used for her Char Kway Teow). If you cannot get this variety of thick sweet sauces, I would suggest sticking to the white version because kecap manis just isn’t the same. HTH! Hi Ju, where can I buy the rose brand thick sweet sauce in Singapore? I have only seen the tiger brand in NTUC. Hi, does this sauce have a Chinese name (can you please provide in Chinese if there is one)? I live in Austalia and wanted to see if my local Chinese grocery store will try and get it in for me. Thanks again. I too live for the black one, living in NY and went back to Singapore last Aug with my husband. He had it for the first time there and was addicted to it. The best so far in Singapore is in Toa Payoh Lorong 1.
the best white carrot cake is at eminent plaza in singapore. best. I love to eat the black version when I was in Penang. In Singapore, I still prefer the white one. Ju, your FRC looks so mouth-watering! Two thumbs up!! Brilliant recipe, Ju! The steps are so detailed and thorough. Thanks. You have inspired me to try my hand at it. We, Penangites, call it Char Koay Kark. Missing it very much. I LOVE char dao kueh, it’s the dish I miss most from home. I am also a huge fan of LIttle Teochew’s blog that I read regularly. 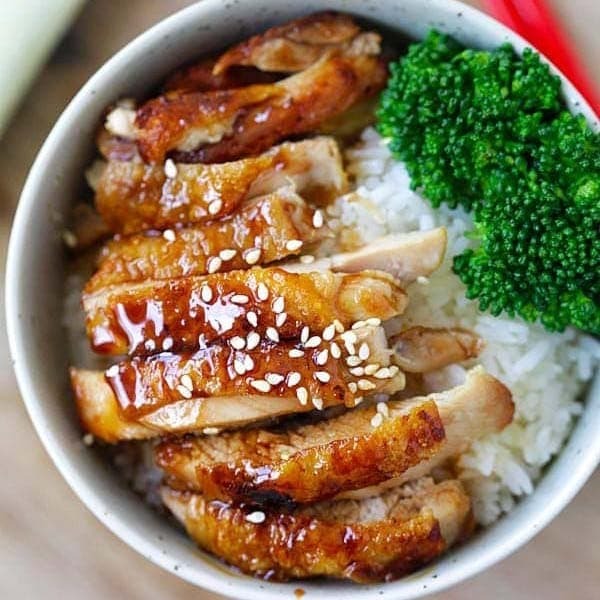 I might just attempt this recipe and take some sweet black sauce with me the next time I’m back in Singapore! Thank you for sharing and both your photos are stunning, as always! May i ask if kecap manis is the same as sweet sauce? Can i use kecap manis to make the black version? Any idea are there different types of chai po? The one i bought in Australia is very salty…maybe there are sweet and salty chai po, are there? Thanks very much! Hi Mary, I know what you mean about losing control when flipping. It helps tremendously to use a non-stick skillet (with sufficient oil) and let the pieces really crisp properly before turning over. HTH! Thanks. I tried the radish cakes and am happy with the final taste – quite close to how I remember it. However, the consistency of the radish cakes was very disappointing. I followed your directions to a ‘T’. It turned out very gummy and just clumped together into a starchy mess when fried. I’m not going to give up – want to try it again. Can you suggest to me what I can do differently next time – more flour, less water? Thanks! Hi Al, glad you tried it out. :) I assume you refrigerated before frying? It makes a difference. I always leave the pieces to brown and crisp thoroughly on one side before turning. And using a non-stick skillet (with oil) helps a lot. Having said that, if you want a firmer radish cake, why don’t you try increasing the rice flour by another 100g and see if the texture is what you are looking for? HTH! Thank you so much !! Your suggestion to add more rice flour helped. Of course, I think I went a little too much and it was firmer than I would’ve liked but at least I know now to adjust flour and water to get the firmness I desire. BTW, I did not need the 250ml of water – the liquid from the steamed radish seemed enough with the additional flour. I also oiled the cake pan before steaming so that the steamed cake released much easier. I think I need to stop with the experimenting for now – the family is tired of having radish cake every weekend for the last 3 wkends!! Can you please feature a childhood favorite kueh of mine that our locals call “bee pow bee” or rice wrapped in rice. It is a flat peach shapped (tho) kueh with rice flour skin as in “chai kueh”, and glutinous rice with bits of dried prawns, mushrooms, halves of roasted peanuts, and thin tiny strips of fatty pork inside. I enjoy your recipes and being a very long retired person, have the time to try a few of your recipes. Great and keep them coming. I have never heard of that recipe, I am sorry, but I don’t know what that is. This looks so mouthwatering! Do you know where I can get the Rose Brand sweet sauce in the US? Specifically California? Hi I had a go making this on the weekend, AND IT’S FANTASTIC! I wish I were your neighbour haha…then I will never move house. Your food makes my mouth water. Thanks for sharing them. Do I need to cover the tin when steaming the radish cake mixture? Could you advise where I could buy the Rose Brand Thick Sweet Sauce in the in NYC or online? My favourite Fried Radish Cake (we call them Carrot Cake in Singapore. I know, odd. Don’t know why. 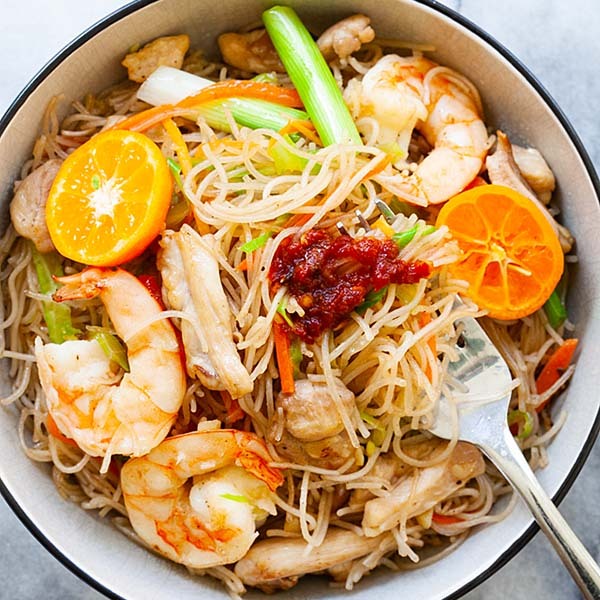 And, thanks so much for posting so many wonderful recipes, I cook because I can’t get most Singapore and Malaysian foods here in NYC, let alone authentic ones and I so appreciate that I can find so many recipes on your blog! Thanks again! Just made my first batch of carrot cake!! It was soo yummmm!! Thank you for the recipe! Quick question.. I have made 2 batches of steam carrot cake. Is it possible to freeze the second batch or do I have to cook them within the next few days? Many thanks!!! Your radish cake recipe is the best I have tried. Easy to follow and definitely a great success with all my London foreign friends who are vegetarians. It is my all time potluck party favourite. Am so glad my sis refer this recipe to me, simply love it. Though the texture of my carrot cake was not consistent. Some parts were soft and nice while some were harder. Any idea what’s the issue that causing it to be hard? Hi, I am not able to buy white radish from where I am. Will it be possible to use parsnip instead? I just want to ask. Im afraid that chai pho didnt halal. So what can i subtitude with it? Oh my, this is a small world! I now I’ve in Australia, but I grew up with the chai tau away from the old Siglap market as well. My dad would do his shopping EVERY Sunday there and take me along. It’s been over 20years now and I still reminisce the good old days when I loved watching this old lady with asbestos hands pop hot metal cups of Chwee Kway onto serving plates straight out of the steamer. Thank you for the recipe and the memory. Hi all. First time I have seen this page. In Perth W.A. we get our Char Tau Kueh at Spencer Village, Fook Kee stall (ex sg) He garnishes with bean sprouts as well as the others. I too, ate at the Wet Market Siglap Chai tow Kuay, & I remember too that beside him was the Kuay Chap stall, Now this was when I was about10 yrs d about 1955, grounds was unpaved than & yes you brought your own eggs… Nostalgia ..
Hello! I have a question: when you say “cook the radish on a very low flame for 30 minutes”, does it mean you have to count 30 minutes as soon as it starts simmering? Or can I just cook it on medium heat (so I reach the boiling point faster) and then I low the heat down to low? Which one of the both option is the best one? Just steamed this up, thanks! As it’ll probably be too much for me how well does it freeze? Can I substitute Brown Rice flour or quinoa flour for the Raddish cake? Can I freeze the steamed carrot cake (not fried) as i won’t finish the lot?